There are quite a few articles you might have read on Crunchify on Spring MVC like Introduction to Spring MVC Framework, Hello World Spring MVC, Upload Multiple Files using Spring MVC, etc. In this tutorial we will go over how to leverage org.springframework.mail.javamail.JavaMailSenderImpl library to send an email using Spring MVC 5.1.3.RELEASE. Here is a final project structure. Make sure to create file accordingly. 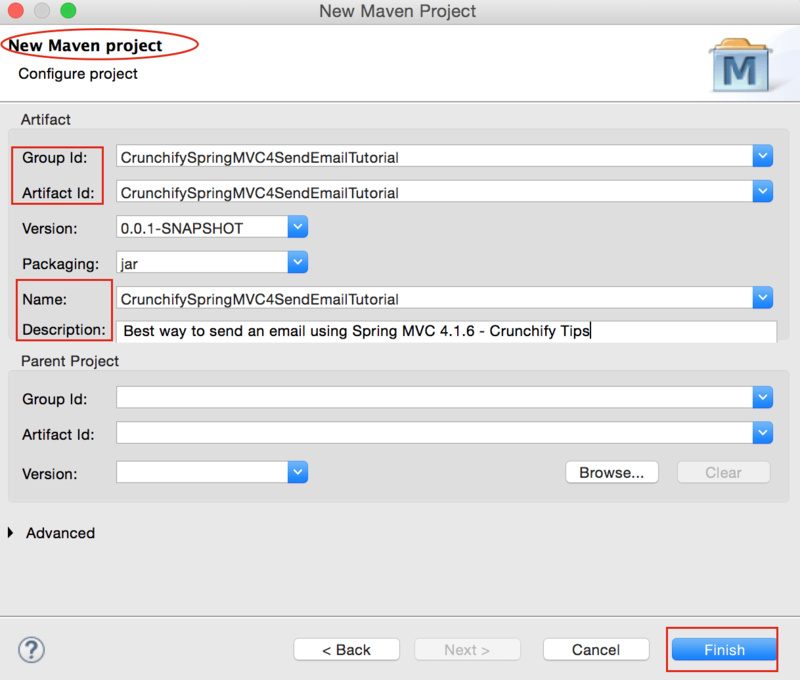 Create simple Maven Project CrunchifySpringMVC4SendEmailTutorial. Provide all information similar to below diagram, i.e. Group Id, Artifact Id, Name and Description which we will use in next steps. Open pom.xml file and add 3 dependencies. Here is my complete pom.xml file. Create Spring Bean file crunchify-bean.xml under src/main/resources folder. Spring beans are configured using the traditional XML approach. In Spring MVC framework bean is an object that is instantiated, assembled, and otherwise managed by a Spring IoC (Inversion of Control) container. Please make sure you update username and password field values with your real/actual values. Create API class CrunchifyEmailAPI.java annotation with @Service (org.springframework.stereotype.Service) under src/main/java folder. 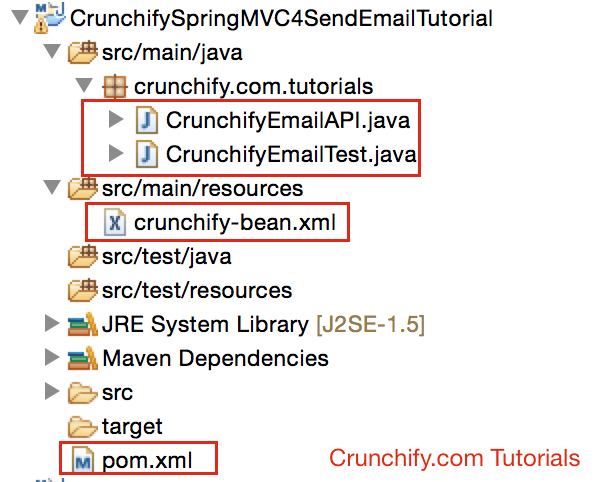 Create Test class CrunchifyEmailTest.java under src/main/java folder. Please make sure you update toAddr and fromAddr above. Now let's run your CrunchifyEmailTest.java and checkout console result. Also don’t forgot to checkout your Gmail. DEBUG SMTP: Found extension "AUTH", arg "LOGIN PLAIN XOAUTH2 PLAIN-CLIENTTOKEN XOAUTH"
How to Validate Email Address Using Java Mail API?